In case you missed it, your bracket probably got a little worse last night thanks to Liberty University’s upset 80-76 win over Mississippi State. 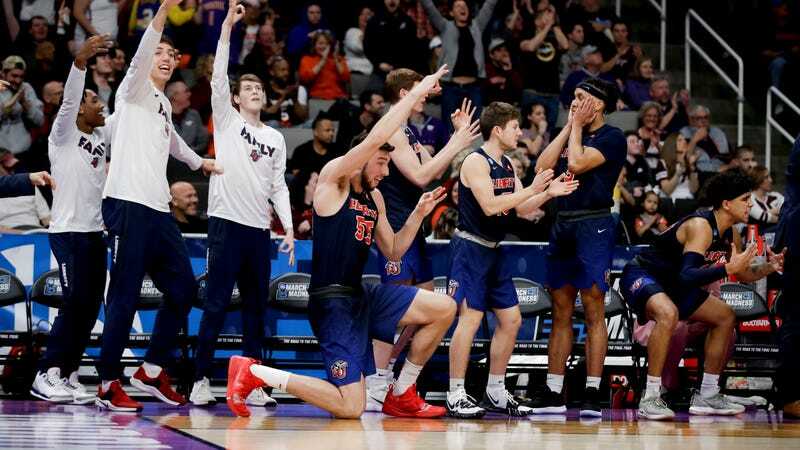 Jerry Falwell Jr.’s infamously strict and alarmingly retrograde university won its first game ever in the NCAA tournament ever and I, for one, am praying to the Lord God in heaven that it never happens again. Liberty was down by 10 points to the five-seed with less than seven minutes to play. Thanks in large part to junior Caleb Homesley, who’s pretty fun to watch, the Flames kept it close and then took the lead with about a minute to go. Homesley finished with 30 points. Nothing against the players, but if Liberty—the ultra-right-wing Christian university that has staunchly supported Donald Trump (drawing ire from some of its own students), and whose legally questionable anti-gay, anti-transgender policies prohibit “sexual relations outside of a biblically ordained marriage between a natural-born man and a natural-born woman”—becomes the tournament’s much-hyped Cinderella team, I’m going to have to learn some satanic rituals. As if the school’s right-wing alliance and upsetting insistence on policing LGBTQ human beings isn’t enough, Liberty also has a nasty habit of hiring disgraced sports men to run its programs and mold young men into the shape of Christ or whatever. Last year, Liberty hired football coach Hugh Freeze, the former Ole Miss coach who resigned after he was caught being incredibly horny and hiring escorts during football recruiting trips. (Wonder what Liberty’s student handbook says about hiring escorts??) Before that, Liberty brought on former Baylor athletic director Ian McCaw, who oversaw the now-exiled football coach Art Briles. Both men were implicated in Baylor’s years-long failure to report and stop rapes by football players. Liberty University is a den of bigotry masquerading as Christianity, and I’m dreading the scenario in which they go on an inspiring NCAA tournament run, thereby bringing them heaps of breathless coverage on a national scale. Dear God, I pray that Liberty lose to Virginia Tech on Sunday night. Hugh Freeze: "[Jesus Christ] Is The Only One I&apos;ve Ever Met Who Can Handle My Junk"
So Who Is Barstool&apos;s PFT Commenter?